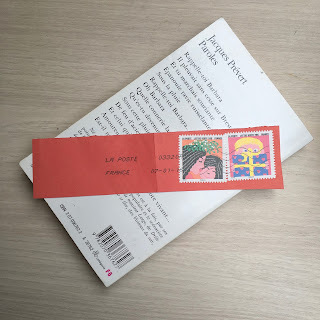 From time to time letters and cards arrive from friends in France and its great to see the range of colourful stamps on various themes or commemorations. 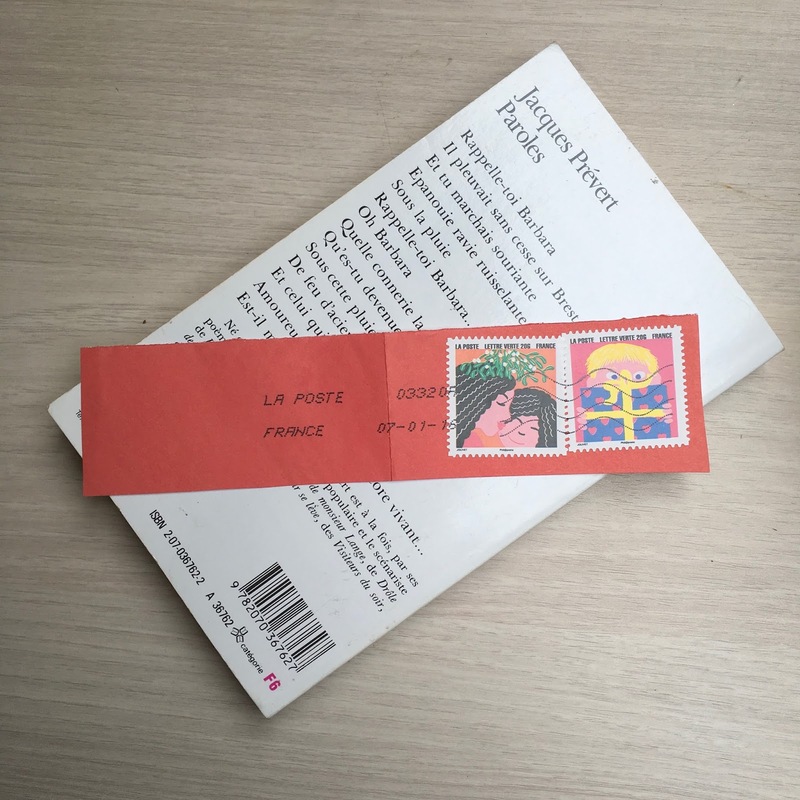 While usually I store the letters in their envelopes and reread them, from time to time I like to make a little bookmark, un signet / un marque-page from the stamps. If it also bears the postmark then it's also a simple reminder of the friend who sent it. And you know friends are like books; the older the nicer. This was a real page turner of a book from Pierre LEMAITRE, whose literary talents were recognised through the award of the Prix Goncourt for another of his works - The Great Swindle. The book was translated from French by Frank WYNNE and published by Maclehose - the same publisher who brought us Karim Miské's Arab Jazz. Alex is the second in a series which features the superbly drawn character of a diminutive Commandant Camille Verhœven (a talented artist himself) and the equally well crafted characters of his team at the Brigade Criminelle in Paris. I've read Alex out of sequence but it was nonetheless a great read, recapping aspects of the previous book, Irène and anticipating the third instalment, Camille. Look, there are no spoilers here...except to say there are twists and turns that although shocking were very satisfying. We start with a brutal kidnapping, incarceration, connected violent murders and painstaking police work. Why not check out the publisher's blurb here and see if it gets you hooked ? If it does, then settle down for a reading in one sitting of un vrai tourne page - a real page turner of French noir. It was a first time visit to Le Pain Quotidien in Kildare Village - and I wondered why I hadn't heard of it before. Of course the initial attraction was the enticing sign in French but a quick look inside was all that was needed to step into the allure of freshly baked breads on artist palette boards and strong flavoursome coffee served in hand-warming bowls. 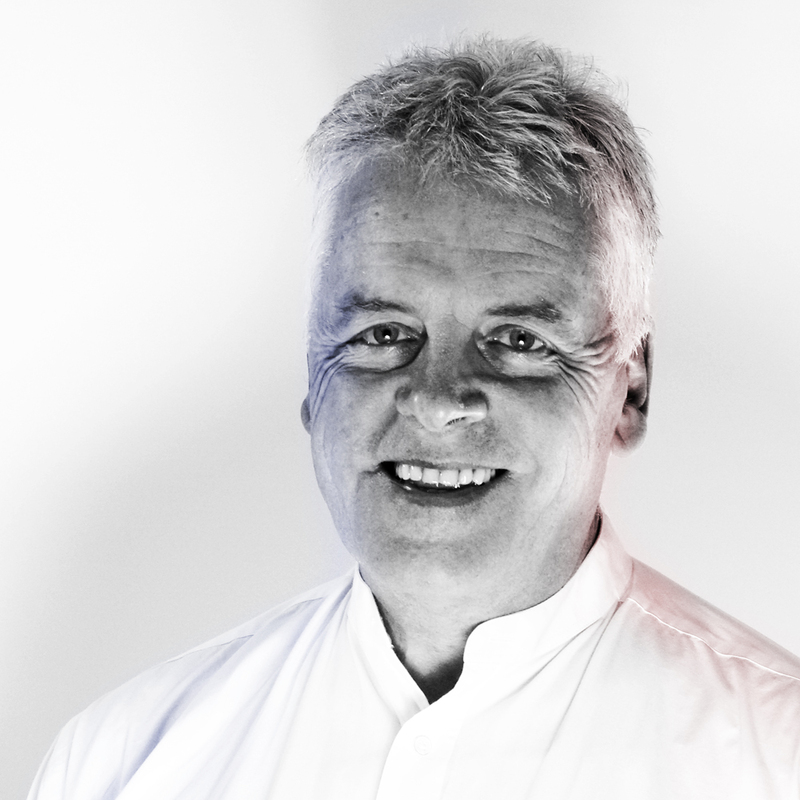 The concept is Belgian rather than French and I love the story of how originator, Alain Coumont's idea of a traditional bakery was eventually realised, how the name was chosen and how that very first table commune came about. You can read that story here. The place has plenty to offer the vegan diner : Bircher bowls of overnight oats (a favourite in our house), Organic Turmeric eggs with Seaweed and avocado. For those with a sweet tooth : Raw Nut Cakes of passion fruit and beetroot and the ubiquitous salted caramel - Coupable ! Guilty! Taking up the central area was la table commune - made from reclaimed floorboards - It was huge and would be perfect for a convivial get together. I thought as I looked at it that here among these diners was the physical expression of all the menu card had to offer. As servers passed by with their large bowls of colourful food we tried very hard to match them up with their mouthwatering descriptions. Time to go but first a stop at the inshore shop for some fantastic breads - baguette à l'ancienne and a quarter of a huge country loaf with baked in fruit. They survived the journey home to Belfast where next day they were warmed and served around our own smaller table commune. More : If you make it down to the Kildare Village you will find Le Pain Quotidien's only outlet in Ireland. It is definitely worth a visit. Check out the website at this link for details of its various food offerings, opening times and how to get there. Finally, do you know of other establishments that have a connection with France or French ? If you do why not share your observations in the comments section below ? Bon app ! À la prochaine !